(Whilst preparing for the readiness of my gel coat coloured body shell I have made a couple more decisions and confirmed the body colours (not the leather yet) as the clock is ticking. The body is due in early November 2017, and I have stuck with the original idea. The picture at the top is pretty much as I want the car but the side pipes will be stainless and I may not fit any overriders. When I asked my daughter she suggested that Yellow was a good colour (she thought it may as well look like a bee) and even though she is right about yellow, I have a bit of a thing about white cars. Counter-intuitively gloss-white doesn’t show dirt as quickly as gloss-black which shows every finger-print (matt black, which has become fashionable for some is only for people who really want to spend their lives paranoid about dirt and hands). I don’t have cars to polish them all the time. I was going to have the wide-spaced underslung exhausts. After telling friend that I was about to build a Cobra they all said one thing, “Great! that iconic look with those side-pipes”. I then spent some time thinking about the practicalities of me getting in the car over hot pipes and realised, this build is NOT about practical matters. This is about fun and Cobras do look ‘right’ with side pipes. If there are any problems with noise (really Nigel?) then I can always wear ear plugs which I believe may be a good idea if I drive it down through France or any other long tour. As I understand it the main problem is wind noise. I am not going to let the ‘originality’ thing dictate my choices but those side pipes do look good! The detail of the Gardner Douglas 4 into 1 and the step-up to the muffler section is very clean. The removal of the body, if ever needed, does involve dropping the exhaust and the connectors to the headers, not a big issue. 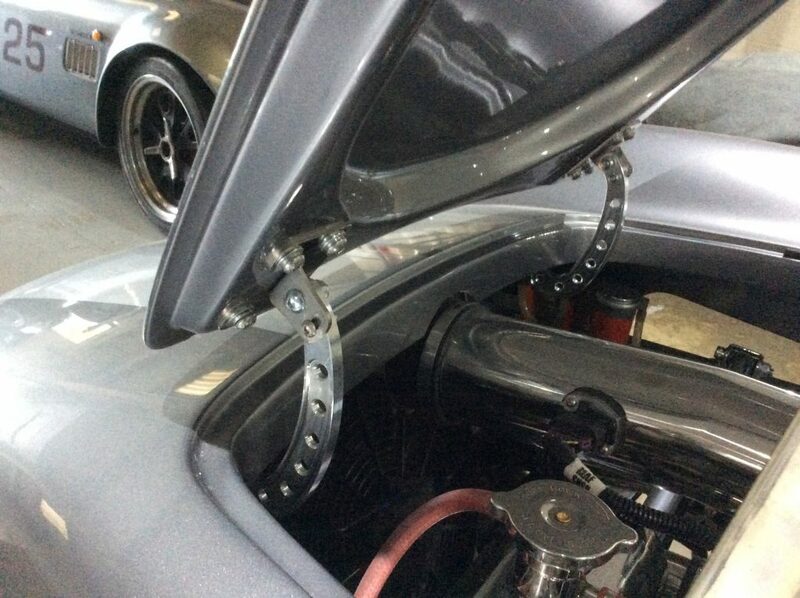 Another matter related to the body work stage is the way in which the boot and bonnet are hinged. There is an option for GD to provide their CNC machined hinges, again they look very smart so that is what I am going to use. Tyres: 245 x 40 x 18″ front, 275 x 40 x 18″ rear. Michelin Pilot Sport/Super Sport. This all makes a very interesting read, did you opt for the side pipes? Any pictures would be very much appreciated. I am looking to undertake such a project. 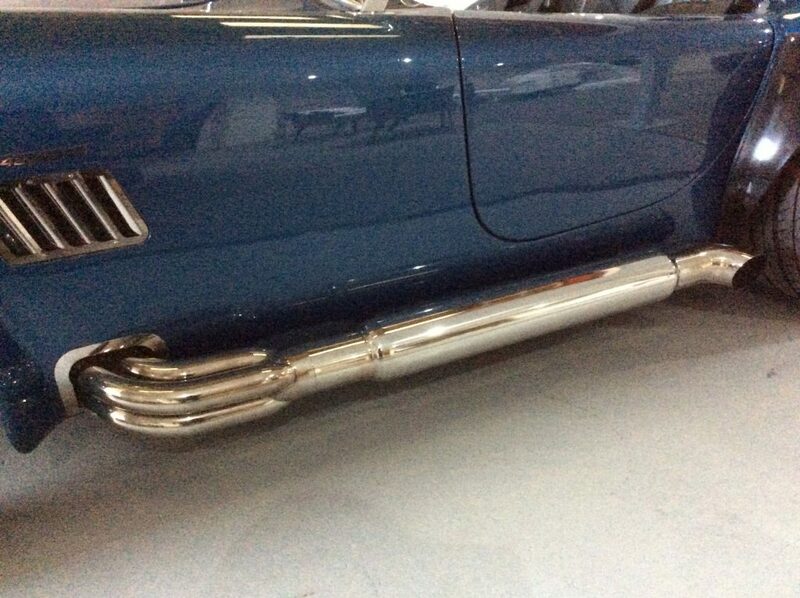 Side pipes look great but it would be nice to hear how you got on doing yours. I have not finished by a long chalk yet. However in respect of the side pipes, I have decided to go for underslung wide spread pipes. The reasons being: side pipes (i) require a lot of carving away of the body and additional venting of heat as the collectors pass through the GRP. (ii) the sound is mainly for people watching, if you are in the car you get a strangely 4/cylinder bias on the exhaust. (iii) The side pipes are vulnerable to clowns stepping on them. So I’m a bit disappointed that the practicalities mean a chopped about car but am happy to have a more “English” look. I will be updating the build pictures shortly. Copyright © 1956 NogCorp Global. All rights reserved.